Last week I was the envy of the office as I was sent two new Poshcorn flavours to try: Coconut & Caramel and Lemon Cupcake. 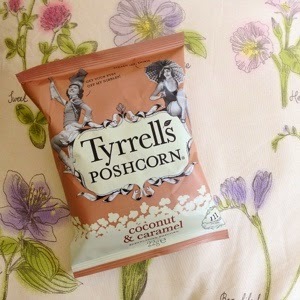 Poped to utter perfection at the Tyrrells Court Farm, Poshcorn is marketed as a healthier replacement to chocolate sweets and crisps. 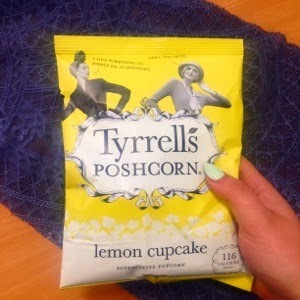 The new popcorn flavours where on a new level of deliciousness, and the lemon cupcake flavour is especially special. Sweet, tart and moreish, there's no other popcorn brand that is currently offering such a unique flavour! Poshcorn is available in both larger sharing bags and small handbag sized bags, available from Waitrose, Sainsbury, Tesco, Morrisons and Costa Coffee. RRP £1.59 for sharing and 0.79p for small bags.